The parameters of cloud server hosting, like any form of cloud computing, can be foggy and unsure. 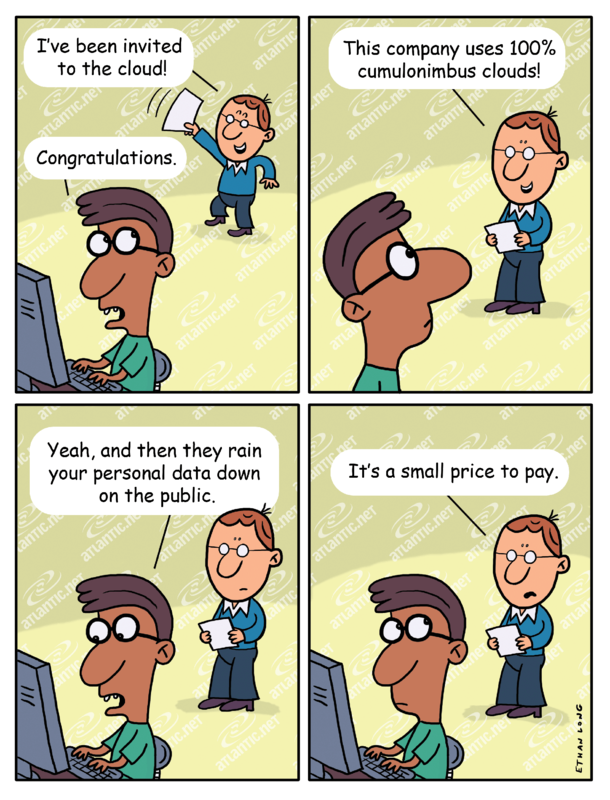 The below comic expresses the dangers that can be found in a cloud’s gray areas. Regardless of misunderstandings and a range of quality provided by various cloud service providers (CSPs), there is a legitimate reason why so many enterprises are shifting their attention and resources to the cloud. Beyond its general positive aspects (and we will discuss little-mentioned ones below), cloud technology has different implications for different types of businesses. Industries such as investing, marketing (both covered previously in this blog), and mobile applications can all benefit in different ways. Mobile apps will be the focus today. We will briefly review broad cloud advantages – typical and atypical – and then specifically explore relevance to companies in the business of mobile applications. Joe McKendrick of Forbes mentions several of the main benefits of the cloud that are typically the point of focus. He also covers several unexpected cloud benefits that are conveyed less often. Agility – The cloud makes it extremely easy to get into new lines of business, or to avoid lines of business wisely, having conducted the applicable testing. Because cloud services are capable of expanding at a moment’s notice, you can test something right away with no long developmental window. Less caution when merging – One reason why many companies choose not to merge is because it’s so costly and labor-intensive to combine two huge pools of data. In some cases, data entry clerks are hired because performing the task with technology is viewed as prohibitively complicated. Cloud data is much more easily accessible. Tapping the popular mind – There is concern that cloud computing is so widely used that it has become a dumbed-down version of legitimate business IT. However, it’s precisely that wide net that now makes it so strong, due to a steady flow of ideas and improvements. Getting high-level – Pushing technology to the cloud allows tech executives to focus their time and money on crafting and planning, so they can lead rather than put out fires. Four out of every five IT dollars currently go to infrastructural maintenance, focus that can be directed forward with the cloud. Matthew Mombrea of ITworld suggests two basic approaches to developing and deploying a mobile app. These different avenues are not specific to the cloud, but cloud computing is a reliable framework for either angle. Quick/dirty – This strategy means you are moving fast, with your main focus being a general test-run with the public. You aren’t concerned upfront with availability to a massive audience. You want to make sure that the app is well-received before you think about potential problems of popularity. Slow/clean – On the other hand, you can painstakingly develop the app and ensure it is optimized to scale rapidly. You are investing the time upfront to make sure there are no hitches along the way. However, you are investing time – and potentially resources – that could have otherwise gone elsewhere if the app proves to be dead-on-arrival anyway. Interestingly enough, Mombrea generally uses the first of the two game plans. It’s certainly a more reasonable approach that takes into account how biased we can be in favor of our billion-dollar ideas, which in many cases are actually thousand-dollar ideas. Kurt Marko of Network Computing believes the cloud is the new frontier for mobile applications. He believes this because the Cloud Server is capable of resolving many of the issues that arise with mobile apps. The cloud is, in fact, just what IT needs to keep mobile app development manageable at a time when 70% of enterprises are currently developing, or in planning to develop, branded mobile apps. Part of the difficulty with mobile apps, says Marko, is that because cell phones differ and because so little fits on the screen, native apps – ones designated specifically for certain devices – are desirable. This realization has been frustrating to the computer world because the web already went through a native application phase previously on PCs. Web-based applications were found to be better integrated, better optimized for syncing, and more secure. automatic synchronization to the cloud. Choose wisely when selecting a SSD Cloud Hosting partner for your cloud-based mobile applications. As suggested by the above comic, don’t go with the cumulonimbus cloud. Generally, you want a hosting service where cloud expertise isn’t an afterthought but a point of focus. Host your mobile web application with Atlantic.Net, where the cloud is king. Cloud server hosting is just one of many services that Atlantic.net offers – we also provide managed, dedicated and private cloud hosting solutions.